Obama Administration Claims “Sovereign Immunity” in Attempt to Dismiss Lawsuit Against NSA over Domestic Surveillance | Democracy Now! Greenwald: "New and worse secrecy and immunity claims from the Obama DOJ"
AMY GOODMAN: Thomas Tamm, I’d like to ask you to stay on for one moment, as we turn to another guest, concern growing, as you’re talking about, by many legal observers over the Obama administration’s attempt to keep secret key aspects of the Bush administration’s counterterrorism policies. Earlier this month, in a closely watched case challenging the legality of the government’s domestic surveillance program, the Obama administration invoked a state secrets privilege and a claim of “sovereign immunity” in an attempt to get rid of the lawsuit. Meanwhile, the Obama administration faces a deadline today to act on whether it will release three classified Bush administration memos that authorized the use of torture. The Wall Street Journal is reporting Obama is wavering on a pledge to fully release the memos. To talk more about this, we’re joined by Glenn Greenwald, constitutional law attorney, political and legal blogger for Salon.com. He’s the author of three books. His latest, Great American Hypocrites: Toppling the Big Myths of Republican Politics. Glenn joins us from Brazil. Glenn, what about the latest news? GLENN GREENWALD: Well, I think it’s one of the — two interesting aspects of it is that, number one, the article suggests, in the Times, that these abuses are not Bush-era abuses but are abuses that are, according to the article, ones that took place in, quote, “recent months” and that the abuses were enabled by, caused by, the 2008 FISA law that the Democratic Congress, with the support of George Bush and Barack Obama, passed. And at the time, the opponents of that bill, across the board, were warning that what this bill does is it guts all the core safeguards that have been in place since the enactment of FISA in 1978 and that the exact kind of abuses that this article reports would be essentially inevitable. And the other aspect that’s worth noting is, as you just said, ever since he was inaugurated, Barack Obama has been running around shunning his Justice Department, running around the country blocking all lawsuits that are ones that are brought against the National Security Agency and the Bush administration alleging that the NSA was illegally spying on the emails and telephone communications of Americans. He has been arguing that those programs are too secret to allow courts to look into, let alone adjudicate the legality of them. And so, he’s been protecting from disclosure the very abuses that the Times this morning reported. AMY GOODMAN: Glenn, can you talk about the significance of the Jewel v. NSA case? GLENN GREENWALD: Yeah, that was — that is an amazing case, because what happened was, in 2008, when the Democrats voted for that FISA bill, part of what the FISA bill did was it immunized the telecoms from the lawsuits that were pending based on this illegal spying. And what the Democrats said at the time was, “Well, don’t worry about the fact that we’re immunizing the telecoms, because we’re not immunizing government officials, the Bush officials who ordered the illegal spying. You can still impose accountability on them.” And so, the organizations that have brought the lawsuits against the telecoms took the Democrats at their word, like EFF, Electronic Frontier Foundation, and they commenced lawsuits against the Bush officials who ordered the illegal spying. And that was a lawsuit commenced in October of 2008 called — that’s the Jewel case that you just referenced. And in October 2008, the Bush administration said to the lawyers who brought the lawsuit, “Well, we don’t really have time to answer the lawsuit, because we’re going to be on our way out the door in January, so we’d like to extend the time to answer into April of 2009, so the new administration can be the ones who handle this lawsuit.” And, of course, the plaintiffs’ lawyers were ecstatic. They thought, well, of course we’d rather have Obama answer the lawsuit than Bush. And yet, last Friday, the Obama administration, the Justice Department, filed the first response to this lawsuit, one claiming that the Bush administration illegally spied on Americans, and what Obama said was, number one, that the program that the lawsuit is alleging occurred. The activities that it’s alleging are too secret, and grave national security harm would result if the court looked at this program and ruled on whether it was illegal, and thus demanded its dismissal. And then the Obama administration invented a brand new radical argument that not even the Bush administration had espoused that says that the government is completely immune from any lawsuits for illegal spying, unless they deliberately or willfully disclose to the public what it is that they learned. So they basically said government officials are immune, when they break the law, from lawsuits, except in the narrowest of cases. And so, the Obama administration sought to bar any lawsuits against Bush officials for illegal spying, after they spent the last eight months assuring the public that Bush officials would still be held accountable even though telecoms were immune. AMY GOODMAN: Explain more, Glenn Greenwald, about this issue of sovereign immunity. GLENN GREENWALD: Well, the idea of sovereign immunity actually is one that comes from the British king. The idea was that the king is too important and too elevated, he’s the sovereign, and therefore is immune from being sued by his subjects. And when the Constitution was written, essentially the idea of sovereign immunity became the government can’t be dragged into court by citizens, unless it agrees in advance to waive its sovereign immunity. And what the Congress has done in many, many cases was pass laws that essentially say that if government officials do certain things, the immunity is waived, and they can be sued. And in the wake of the eavesdropping abuses that were discovered and documented in the mid-1970s as a result of the Church Commission, the Congress passed numerous laws, that the president signed into law, that said exactly that. They passed FISA and the Wiretap Act and amendments to the Stored Communications Act, which explicitly said that if the government illegally engages in surveillance on Americans, they can be sued, that causes of action exist on the part of the victims of the illegal eavesdropping to sue the government officials who are responsible. And the laws say that as explicitly as possible. And what the Obama administration is claiming is that there are provisions of the PATRIOT Act which secretly or implicitly repeal those laws and that the intent of the PATRIOT Act was to immunize government officials, to expand the sovereign immunity so that government officials can no longer be sued for illegal eavesdropping, notwithstanding these explicit laws that say that they can, in the absence of claims that they willfully disclose to the public what they learned. In other words, government officials, according to the Obama administration, can sit there and read your emails and listen in on your phone calls, even when doing so is illegal and even when they know that what they’re doing is illegal, and you can’t sue them unless they willfully disclose to the public what it is that they learn. It is an extraordinarily extremist claim of government immunity that, as I said, not even the Bush administration espoused. And it’s designed to protect government officials, including Bush officials, from any consequences for having spied illegally on Americans. AMY GOODMAN: Glenn, I want to ask Thomas Tamm, do you think government officials, the telecoms, should be held accountable? THOMAS TAMM: Absolutely. You know, when I was in OIPR, we worked every day with the telecommunications companies. They knew what was legal. They knew what they were authorized to do. They employed the best law firms in the country to advise them. And I really think that the only way we’re ultimately going to really learn what happened is through litigation, such as what Glenn was talking about and with regard to the immunity. I mean, to me, why don’t we find out what was done, and then you can make a discretionary decision as to whether you want to go forward in any other fashion or whether good faith is a valid defense? Personally, I think that the Bush administration officials should be held accountable. I’m actually learning something as I have in the past, from hearing Glenn talk or reading his blog, about this sovereign immunity. I was unaware of that. And that’s truly disappointing. AMY GOODMAN: And Glenn Greenwald, very briefly, the significance of what Thomas Tamm did back in 2004, when he slipped into the D.C. metro and made that phone call to the Times? GLENN GREENWALD: Yeah, it’s one of the most heroic acts of the Bush era. It’s exactly what we’ve been lacking in our government, are brave whistleblowers. And Thomas Tamm is one of the few who was patriotic enough to do it. AMY GOODMAN: And lastly, Glenn Greenwald, thirty seconds on the torture memos, what they said. GLENN GREENWALD: Well, these torture memos are the most graphic of the documents that exist, where they not only generally redefine torture but explicitly authorize the tactics that are clearly war crimes. They said it’s perfectly permissible to wrap people’s heads in towels and bang them against the wall. These are not intelligence documents; these are laws that our government operated under. And the idea of keeping these concealed, secret laws, is as tyrannical as it gets. And this is a huge test for the Obama administration today. AMY GOODMAN: I want to thank you both for being with us. 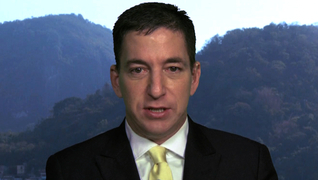 Glenn Greenwald, constitutional law attorney and political and legal blogger for Salon.com. And Thomas Tamm, congratulations on receiving the Ridenhour Prize today — it’s going to be streamed at ridenhour.org — for whistleblowers who speak out in these critical times. Thanks so much for being with us.